Convenience has become a defining element of the past few generations and it fuels even very menial daily decisions whether we know it or not. Should I make my own coffee at home and bring a reusable thermos to work or just stop at Starbucks? Should I make and pack a lunch or just get take-out? Do I really feel like walking a few extra blocks to get the subway when I can just call an Uber? These seemingly small and meaningless decisions have big impacts that we don’t even think of, especially in terms of pollution with plastics, Styrofoam, and garbage in general. This convenience has made us a very wasteful society and nothing demonstrates that more than the Great Pacific Garbage Patch. 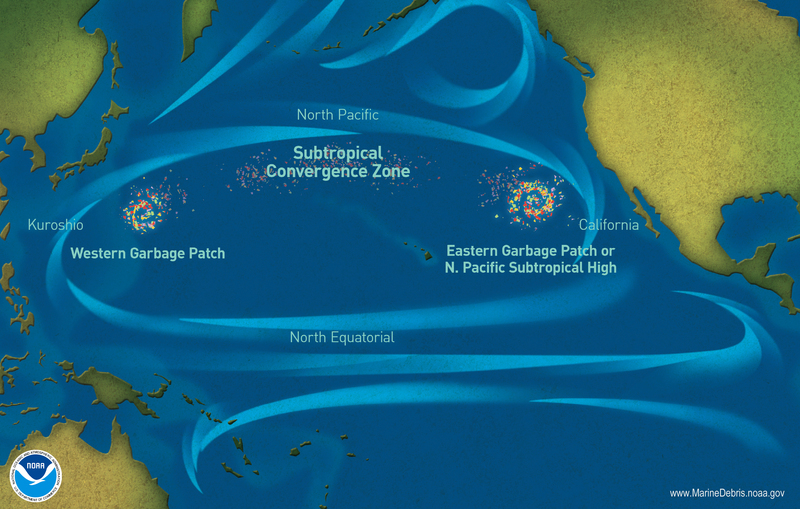 The Great Pacific Garbage patch is a spot in the ocean between Japan and California in the North Pacific Ocean where the currents pull together much of the garbage and debris that wind up in the oceans. The most common type of garbage found here are single-use plastics and they range from very small, micro-bead sized plastics to plastic bottles and bags, and even plastic six-pack yokes. While litter in general is horrible for the environment, plastics pose a particularly difficult problem because they do not biodegrade but rather photodegrade into smaller particles (Sigler, 2014, p. 1). This makes cleanup difficult as these small particles can wind up slipping through nets and may barely be noticed during ocean and beach cleanups as opposed to larger items such as plastic bags and bottles. 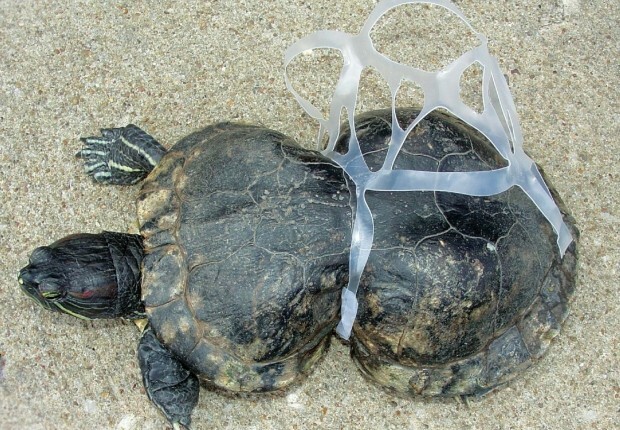 Not only are these plastics detrimental to the health of the ocean ecosystem, but they also threaten wildlife that may mistake the plastics for food or get caught in the plastic six-pack yokes while swimming. There have been cases of turtles getting caught in the rings while still young that wind up with deformed shells for the rest of their lives unless the yoke is removed early enough (Sigler, 2014, p. 3). Additionally, there has been an observed increase in the rates of cancer in marine organisms, which many scientists are contributing to the high amount of BPA containing plastics (which have also been linked to causing cancer in humans) floating in the ocean (Erren, Zeub, Steffany, & Meyer-Rochow, 2009, p. 1). While humans may not see any negative implications to themselves in a situation like this, the fact is that this plastic bio-accumulates in the food chain; plastic cannot break down and pass through the digestive system so a fish that mistakes microplastics for food will ingest the material, which then becomes fat soluble, and if that fish is killed and eaten, that plastic is then passed to the consumer (Sigler, 2014, p. 1). As the health consequences of human ingestion of plastics down the food chain have not quite been established, it’s important that we are aware of the issue and ensure we do something to rectify the problem. However, health is not the only human consequence of our excessive reliance on plastics and the convenience they offer because plastic materials are a major market failure. It is estimated that, “after a sort first-use cycle, 95% of plastic packaging material value, or $80-120 billion annually, is lost to the economy” (World Economic Forum, 2016, p. 6). Additionally, due to the amount of plastics that are never recycled or properly disposed of, there are costs present in regards to environmental degradation and impacts to tourism industries that find plastic waste washing up on their beaches, making swimming unsafe and unsanitary. In regards to climate change, it is estimated that the greenhouse gases released when producing plastics pose a cost of approximately $40 billion annually in externalities, which is greater than the plastic packaging industry’s profit pool (World Economic Forum, 2016, p. 6). The above economic arguments have spurred a movement known as “the New Plastics Economy” in which recycling processes are further developed and made more efficient, people are educated on the importance of keeping these materials circling through the economy instead of just disposing them, and plastic products themselves are redesigned to be more environmentally friendly and, ideally, biodegradable (Grace, 2017, p. 8). The biggest issue with the movement, however, is that every member on the plastic supply and demand chain needs to cooperate in order for the problem to be solved. Manufacturers need to agree to limit the amount of plastics the make and use, businesses need to agree on finding renewable or sustainable alternatives, and consumers need to be ok with using these alternatives (Gold, Mika, Horowitz, Herzog, & Leitner, 2014 and Confino, 2017). With an ocean that is predicted to contain more plastic than fish by weight by 2050 (Confino, 2017), it is becoming more imperative that we find a solution to this problem. 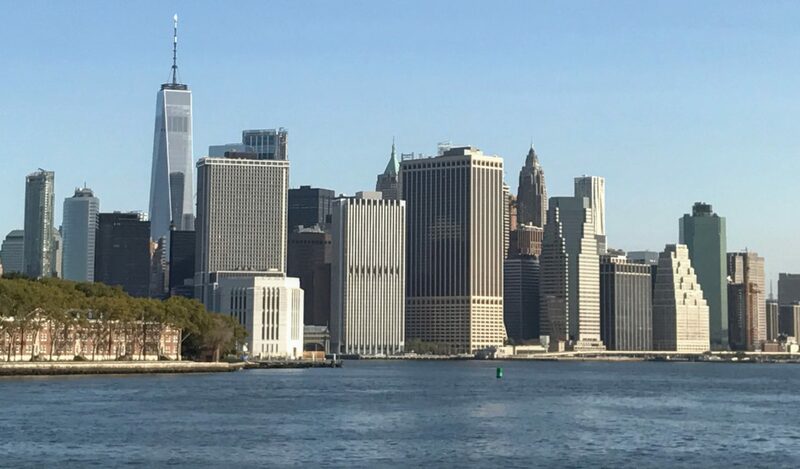 While the economics as they currently stand make it hard to fathom alternatives to plastics due to their relative cheapness and convenience, externalities need to be taken into account and future probable economic impacts need to be discovered and noted so as to avoid devastating and irreversible impacts to humans, the environment, and the wildlife that depend on these now polluted waterways.